Article first published as Book Review: ‘Characters on the Green’ by J. Peter Hoyer on Blogcritics. “Characters on the Green” by J. Peter Hoyer is a humorous look at the people encountered by the author during his decades-long love affair with the game of golf. Hoyer indeed met some real characters – both his regular partners and random people added to his foursome by course starters, on golf courses across the country. These include good golfers and bad. More importantly, it includes many people who wouldn’t be considered normal in settings anywhere other than a golf course. Hoyer is a shrewd observer of people, and able to pick out and describe those quirks and idiosyncrasies which create humorous stories. And, the stories are not by any means limited to golfers. Some of his better stories are of characters he met during his career in the Army and his tenure coaching young golfers. Perhaps the best section of “Characters on the Green” is that describing golf technology and overall golf tips. These are found in golf magazines, golf TV channels, and random tips from other golfers. Every one of them is “guaranteed” to add ten yards to each shot, or improve score by 10%, or provide some other dramatic improvement. Hoyer quipped that if a golfer had enough money to invest in all of the available technology, each with such a guaranty, the golfer would surely improve his score well enough to join the professional golf tour. The flip side of this is equally true, since every bad round of golf can easily be blamed on poor equipment. A golf partner of Hoyer once blamed a poor round of golf on his socks – the socks were simply too heavy! 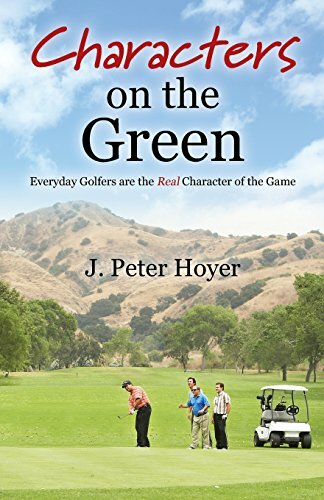 “Characters on the Green” by J. Peter Hoyer is an easy-to-read journey through the author’s encounters with some interesting people – most of who were met by him on a golf course, but all of them skillfully described with wit and humor.